If you are like me, then you know that getting from the car to the pool/beach and vice versa is always a juggling act. There are hands to hold, bags over the shoulders, and toys to carry. 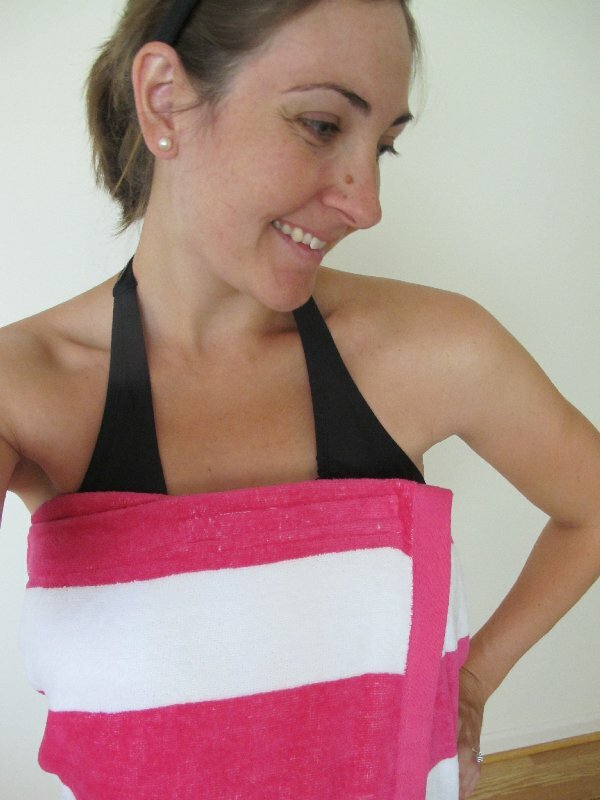 The last thing you need is the towel that you carefully wrapped around your chest or waist falling off as you walk. Well, worry no more. 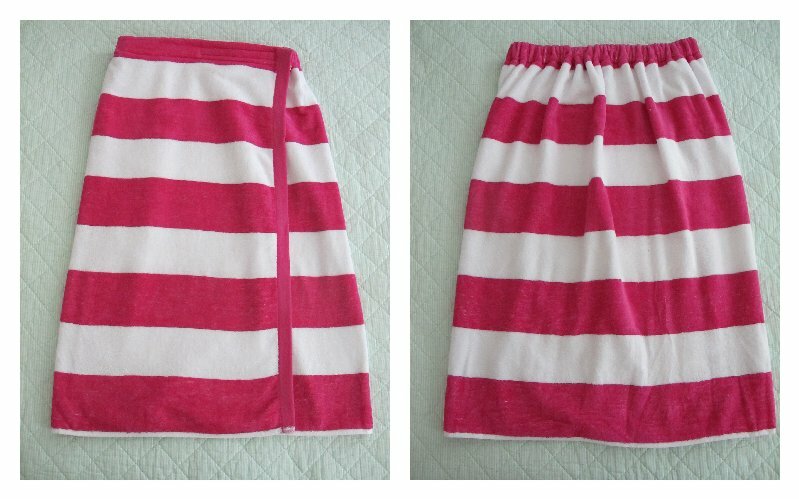 All you need is a beach towel, some thread, a sewing machine, elastic, and some velcro and your problem is solved! You don't even need a huge chunk of time to complete this project, just a measly 30 minutes or less. I literally made mine in the 15 minutes that we spent getting bathing suits on and getting ready to leave for the pool. And you know what is the greatest part about this? Well let me tell you: there is NO CUTTING involved! There are no patterns to cut out, and no towel cutting whatsoever. It's that easy and that quick, I promise! 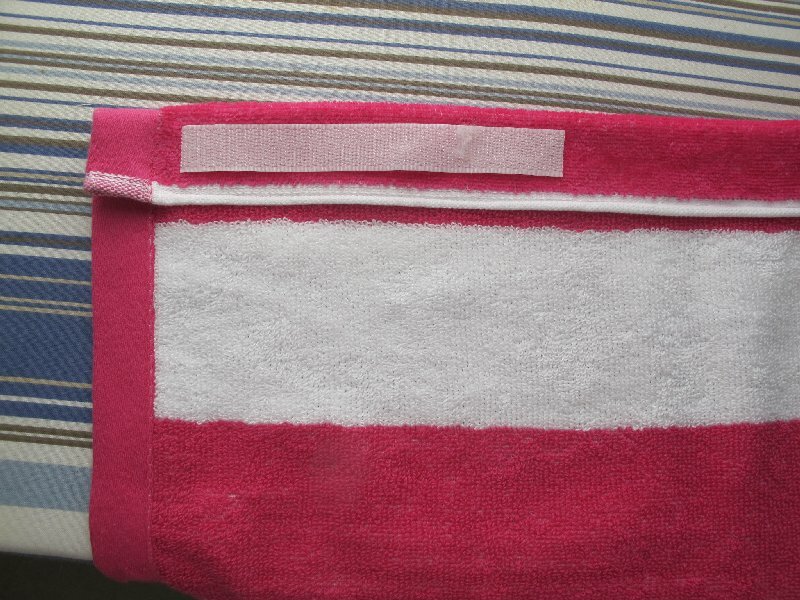 Gather your materials (beach towel, elastic, thread, velcro, straight pins). 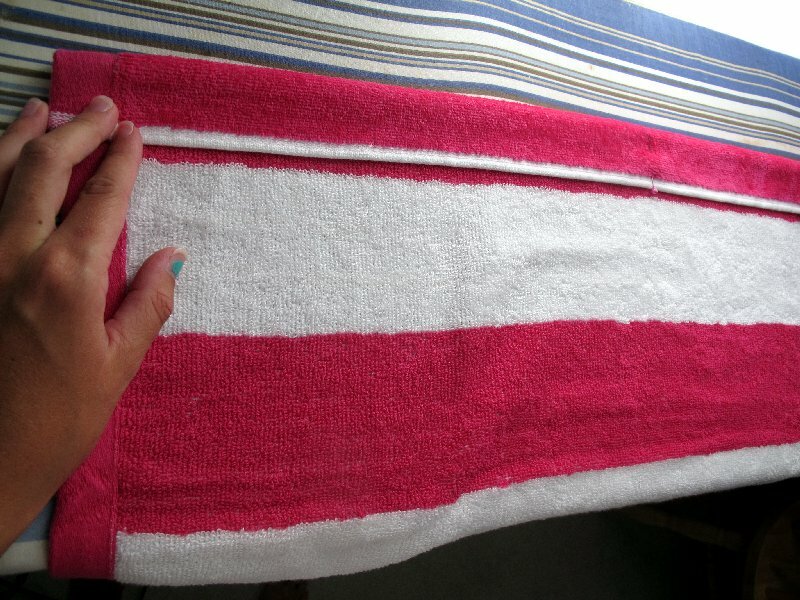 Fold your towel in half with the short edges of the towel matched up together. Place a pin in the center fold. Measure across your chest from arm pit to arm pit. Then, take that same measurement to your towel. You can unfold your towel now. Measure from the short edge over and place a pin in that spot. Repeat this step for each edge of your towel. 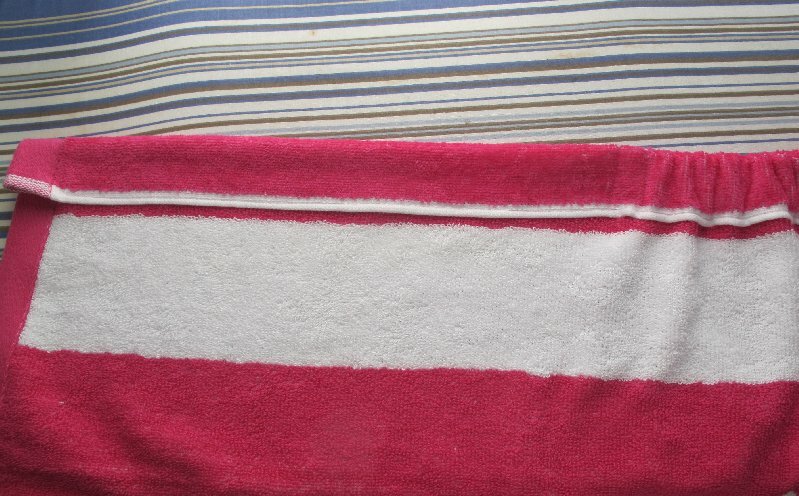 Flip the top, long edge of your towel down. Make sure you flip it down atleast as wide as the width of your elastic. I turned mine down about 1 1/4 inches. Now, with your sewing machine, this turned edge from pin to pin. 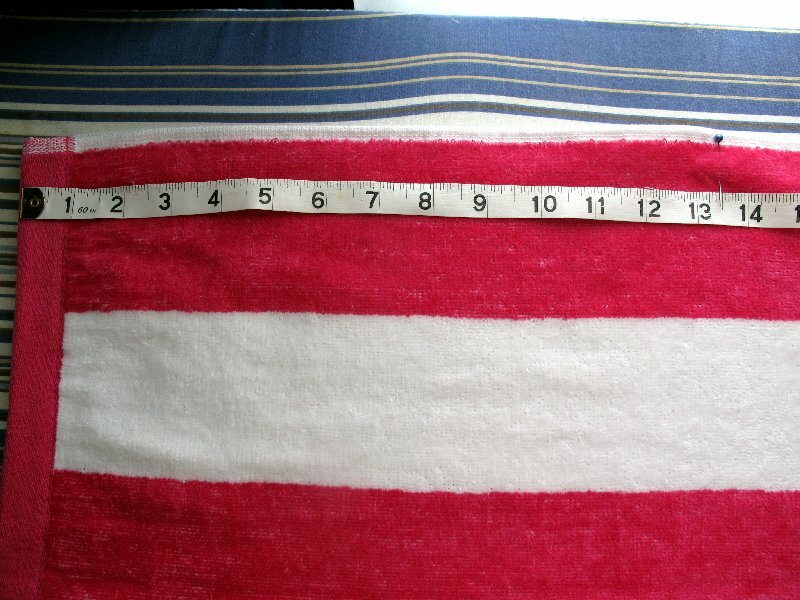 There should be some length left unsewn on each side, depending on your chest measurement and where you placed your pins. Measure your back from side to side and cut a piece of elastic that size. Insert your elastic and string through the channel created by the last step. 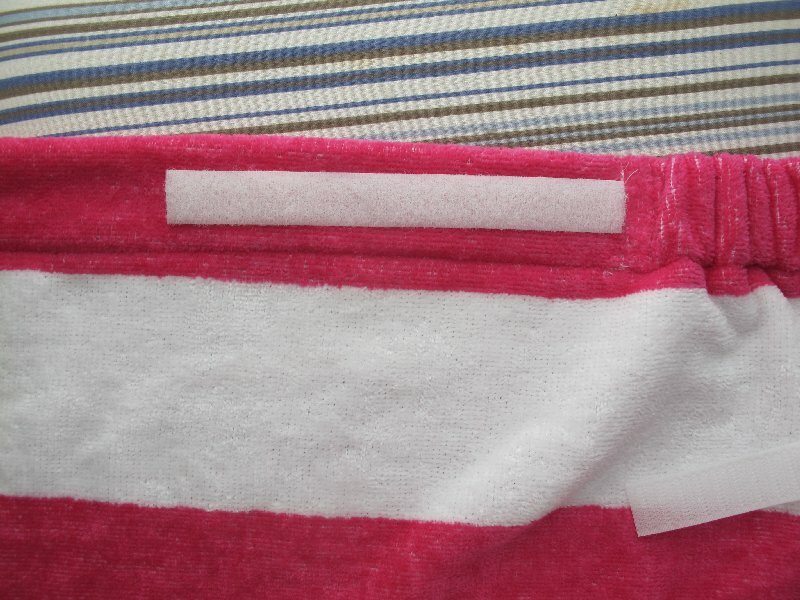 Sew each edge of the elastic down. 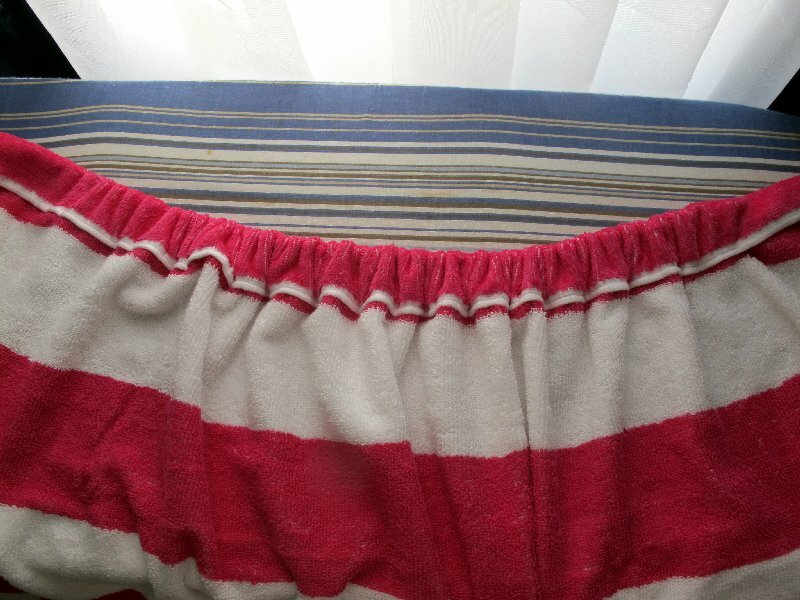 I sewed two lines for extra hold. You should be sewing at the point where your pins were placed on each side. 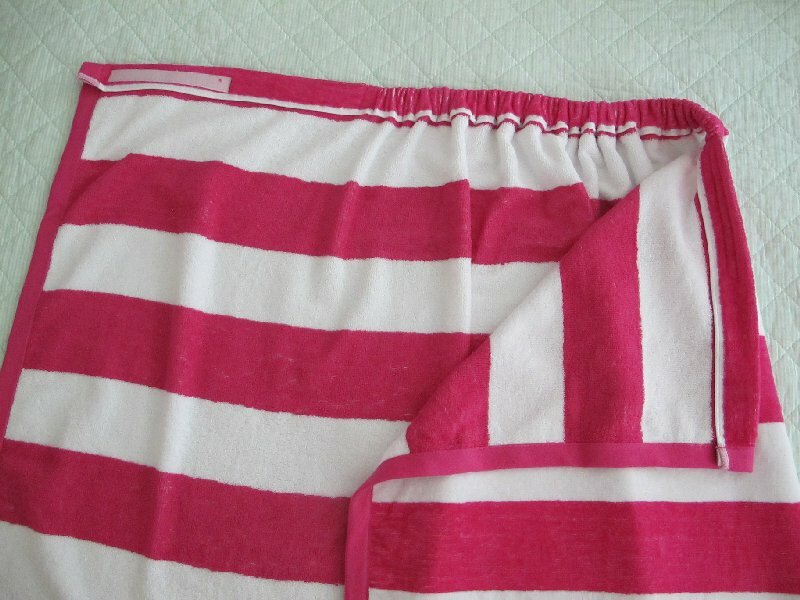 You should now have a gathered section in the middle, top edge of your towel. Now, you can sew down the leftover edges. Cut some velcro to your desired length. I only had about 6 inches of velcro available, so that is how much I used. 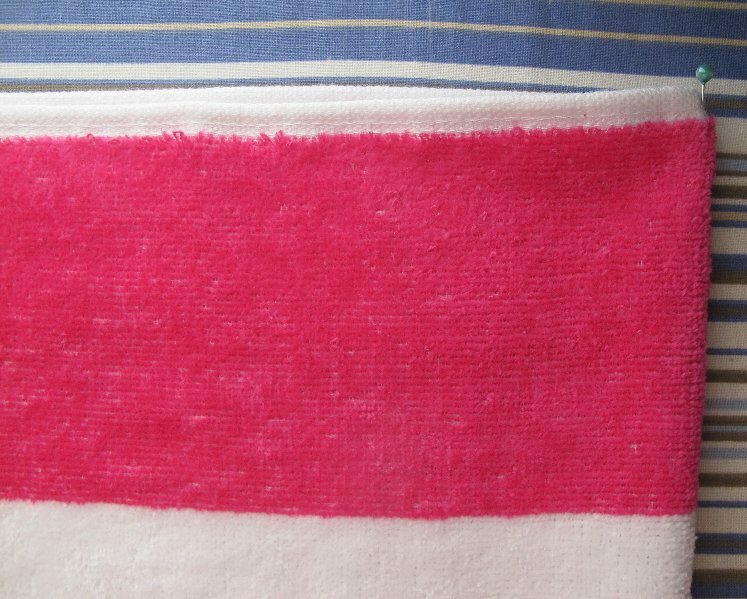 However, you could use velcro along the entire section of non-gathered towel. 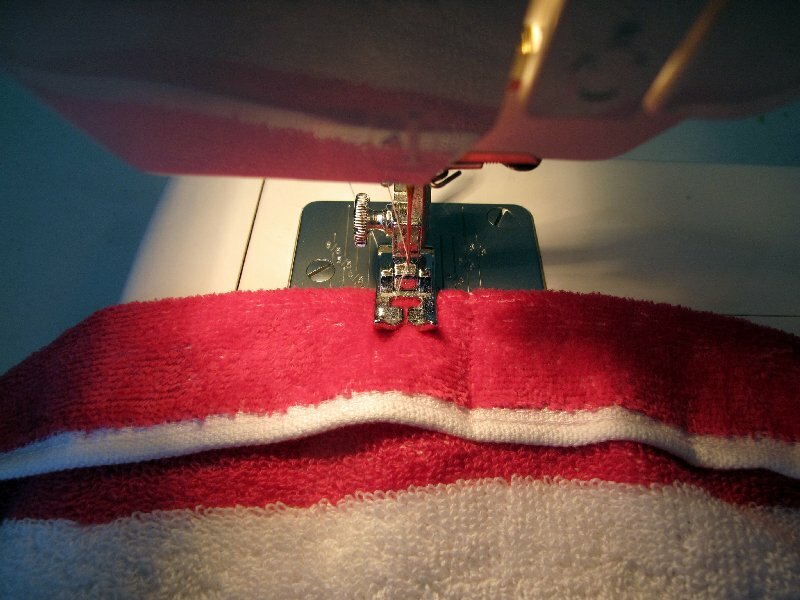 Sew one side of velcro to the outside of the towel, next to the gathered section. 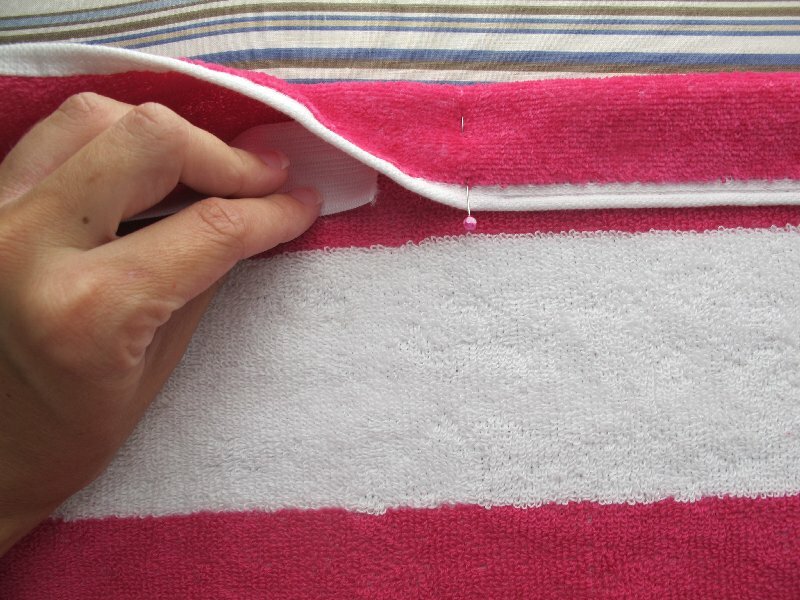 Sew the other piece of velcro to the inside of the towel on the edge. And that is all there is to it, folks! 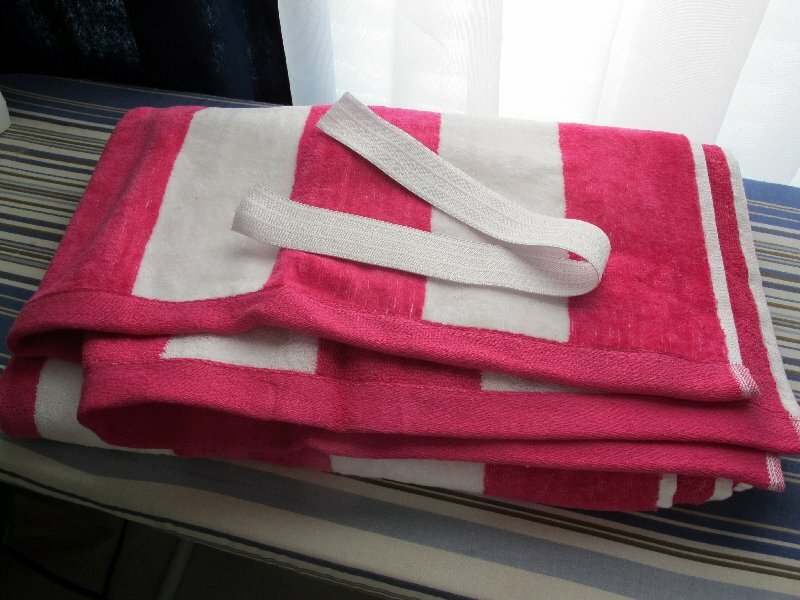 All of the towel's edges are already finished, so there is no need for any more sewing. If your towel wrap ends up being a little too loose, all you need to do is shorten your elastic piece so that it gathers more in the back. 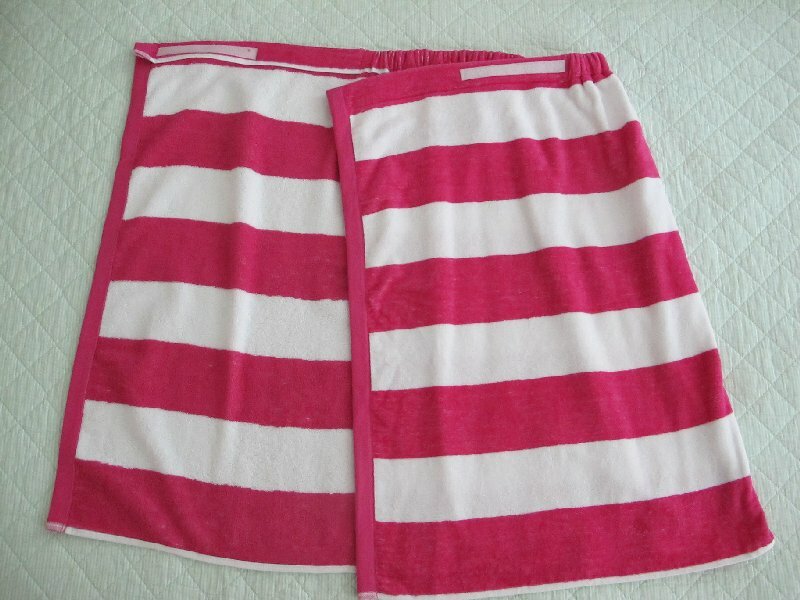 My towel wrap is the perfect length for me, hitting me just above the knees. Now I can walk to and from the pool all covered up. No more worries about my towel slipping down as I walk! I love mine, and have worn it almost every day since I made it. I'm actually wearing it right now as I type this. The thought just occurred to me that this could also be a great bath robe as well! Just throw it on after a shower and wear it while you blow dry your hair, put on make-up, or decide what to wear! I like that it uses Velcro! Thanks for the idea! oooooo!!! I love this lil' project too!! Very good idea :) Now I want to make one! 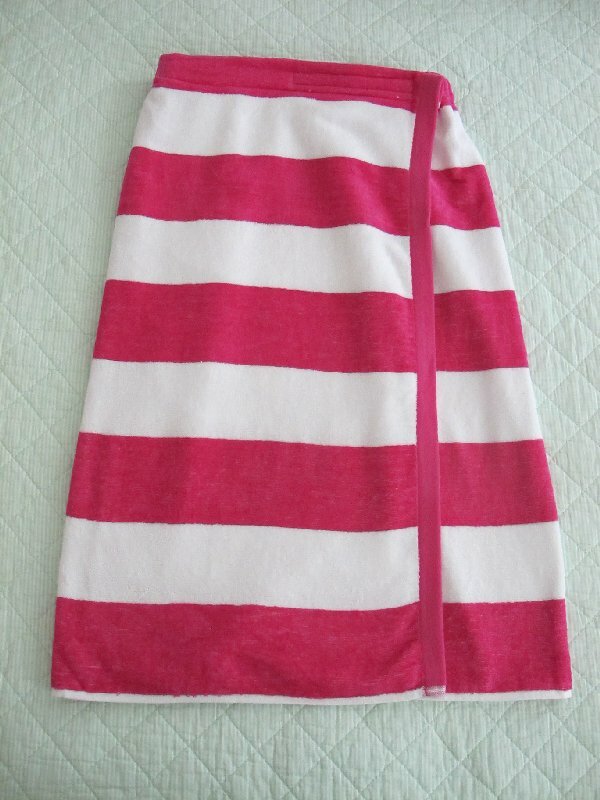 Looks so cute on you too...I even want to copy your towel style & get a pink & white stripped one! May I ask where you got your beach towel? Great idea! I may have to give this a whirl! What a neat idea! 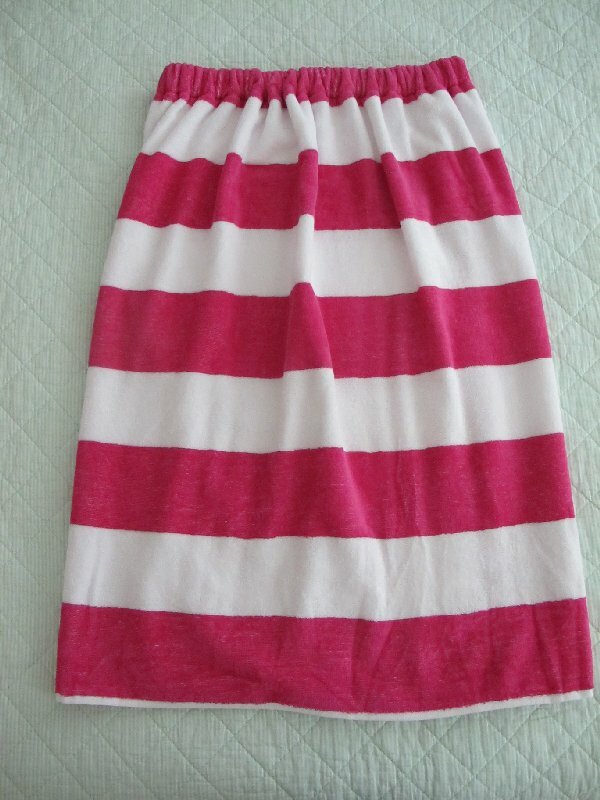 love the stripes too! You are ridiculously adorable! That is SO brilliant! You are great!! LOVE this! I have always wanted one of these but can never seem to find one! I may just need to try this out! WOnderful idea! I love quick easy projects! So great! I love that it is no cutting using a whole towel. Think I might need to make a few of these. My kids can never keep their towels up either! You did a great job! I'm featuring this on Topsy Turvy Tuesday's tonight. Thanks for linking up!